Made of steel, durable enough to survive into the next century. The bread-box principle remains as true today as it was in your grandmother's time: to stay fresh, bread and baked goods need air--but not too much. 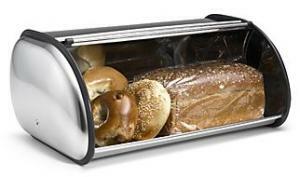 This box lets in just enough air so that loaves don't get soggy and crusts stay crisp. Like its function, the form of this box is pleasingly retro. Plenty big enough (17 inches wide by 7-1/4 inches high by 10 inches deep) to hold family-size supplies, its roll-top door opens and closes smoothly. The stainless steel on this bread box gleams.